Memorial Day is the unofficial beginning of summer, and with it comes with some seasonal dangers. Barbecuing is one of the activities which comes with some risks. It’s important to take action to help reduce the likelihood of accidents happening when you decide to begin grilling. As with many things, preventing injuries from occurring not only will save you a lot of pain and suffering, it will also be good for your pocketbook. Memorial Day weekend is the start of the barbecuing season for many people. For those who barbecue, they’ll also be spending more time in the sun. It’s essential to make sure you put plenty of sunscreen and proper clothing on to protect your skin. The vast majority of people simply don’t know how to correctly put on sunscreen, so it’s worth learning how. It’s also important to make sure that you reapply it often during the day. Doing so can save you thousands of dollars by keeping your skin wrinkle-free longer as you grow older by not having the need to purchase expensive wrinkle creams. It can also help prevent costly medical expenses that would come with the development of skin cancer. 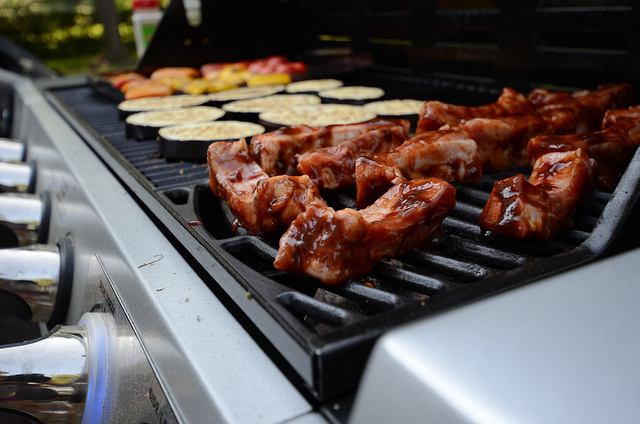 Another major risk that comes with barbecuing is food poisoning. The Centers of Disease Control and Prevention (CDC) estimate that some 48 million Americans will contract food poisoning this year. To help prevent food poisoning, it’s important to not to leave food sitting out for extended periods of time in the sun before cooking it. For meat that you put on the grill, make sure that it gets thoroughly cooked. It’s advisable to use a meat thermometer to ensure that heat is getting caught throughout, not just burning the outside, which can be a common occurrence with barbecues. It’s also important to wash all vegetables before you put them on the grill. By taking some simple precautions, you can reduce the risk of getting food poisoning when barbecuing. The space around barbecue grill can be a dangerous place for kids. It’s important to keep children away from hot grills where they could have an accident that could result in the child getting burned. Experts recommend a 3-foot kid-free zone around barbecues to lessen the danger. It’s also important to make sure that the barbecue grill is clean to begin the summer season. Many people put away their grills for winter without properly cleaning them. Fat and grease that accumulates over the grilling season can catch fire and send up flames unexpectedly which can injure a person. Cobwebs can have the same effect. Clean the barbecue grill to prevent these issues. Murry’s, a Pennsyvania based company, has issued a recall on Gluten Free breaded chicken after the Colorado Department of Agriculture discovered there was high risk that the chicken was contaminated. The Federal Emergency Response Network lab discovered the toxins during a routine inspection. 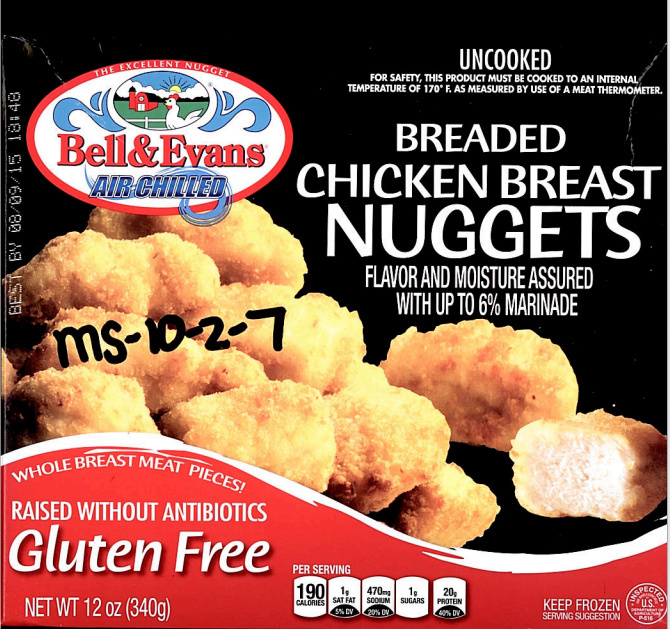 The Gluten Free Breaded Chicken Nuggets from Bell and Evans have been officially recalled for staphylcoccal enterotoxoins. The USDA issued a statement in complete cooperation backing Murry’s for the recall. Staphylcoccla enterotoxins is caused by a staph infection-type bacteria and can result in food poisoning if eaten. The food poisoning occurs when food contains the toxin-producing staphylococcus aureus bacteria. If ingested, the toxins can cause adverse effects in as little as 30 minutes, and can take up to six hours to set in, according to the Centers for Disease Control and Prevention (CDC). Effects include a wide range of gastrointestinal reactions from nausea to cramps and diarrhea. All effects last anywhere between one to three days. No reports of possible food poisoning have been filed yet, but since the recall was only issued within the last 48 hours, there may be a few cases that are yet unknown. Murry’s and the USDA did jump on this recall quickly and hope it will result in fewer instances of actual food poisoning. If you suspect you are having symptoms or have questions, all agencies are referring people to their own doctors. If you have some of this in your fridge or freezer, look for these specifics: a “best buy” date of August 9, 2015, a USDA inspection identifier mark of P-516. Look specifically on Bell and Evans 12 ounce boxes of Gluten Free Breaded Chicken Breast Nuggets and 10 ounce boxes of Gluten Free Breaded Chicken Breasts. Approximately 31,689 pounds of the product have been placed on the recall list for the bacteria that is found on the skin and noses of healthy humans and animals. To prevent contamination, it is best to follow proper food handling procedures: keep surfaces and kitchens clean and sanitized and don’t prepare food if you have infection in your eyes or nose or with open sores on your hands. Today’s question to get your morning rolling is, Should you eat food after the expiration date? This, of course, is met with and lecture that she will not have any sympathy for me when I come down with food poisoning and need to be rushed to the hospital. I can’t say I’m much better as I give her the lecture that it’s a waste of good money to throw out food just because the date on the package has expired and the food is still obviously good. I know I’m not the only one that feels this way. Although I don’t go out of my way to be as extreme as this guy, it shows that people throw away a lot of food that is still edible. What is your take? Is it worth the risk to save and not waste the food, or is it better to play it safe and not wind up getting sick and ending up in the doctor’s office due to spoiled food? Please share your own experiences on this topic as a wide variety of views and thoughts are helpful to everyone. If there is one thing that I have learned about personal finances from all of you is that there are always exceptions to the rule and differing circumstances can mean completely different solutions. If you have a blog and you have written about this topic in the past, feel free to link to your writing (although a short summary would be helpful). If you have recently read a good article on this topic, please links and share in the comments.